Jaguar has unveiled its newest and lightest sports saloon at an event in London this week: The tech-heavy and decidedly attractive Jaguar XE. Jaguar's new XE S sports saloon fashioned quite the entrance for itself. It was flown through London suspended beneath a helicopter, giving citizens ample opportunity to snap pictures of it orbiting the Shard on its way to the launch event in Earl's Court. The new motor sits below the XF and XJ in Jaguar's saloon line-up and focuses on aluminium construction for improved aerodynamics and streamlining. Of course, being Jag, it's also looking pretty good inside and is flush with the latest car-based tech on offer. That includes projecting high-contrast colour images onto the windscreen via a laser head-up display (HUD) that gives the driver information like speed and navigation without having to look away from the road. The XE also features stereo camera technology that the car uses for its autonomous emergency braking system. The cameras can accurately measure speed and distance of objects ahead and rely the information to the braking system to avoid collisions. Under the bonnet? Well, that'd be a supercharged 3.0-litre V6 engine linked to an eight-speed automatic transmission and a 0-60mph time of 4.9 seconds. "Jaguar's position as the leading premium manufacturer of aluminium vehicles allowed us to develop a light, stiff body structure that is ground-breaking in its class," said Kevin Stride, vehicle line director for the Jaguar XE. 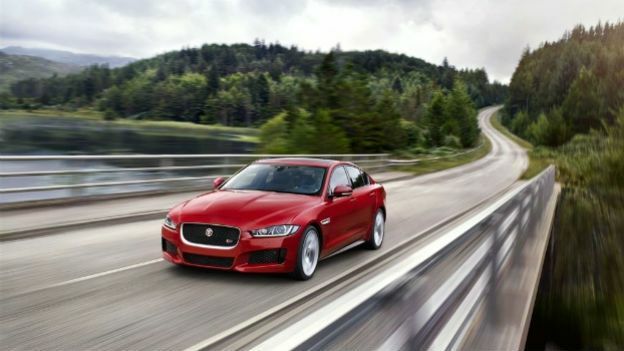 "It enables the XE's advanced chassis technologies to deliver an unprecedented balance of agility," he said. The XE S will go on sale in 2015 and will be joined by other petrol and diesel XE models boasting 2.0-litre, four-cylinder engines with six-speed manual and eight-speed automatic transmissions. According to Jag though, the new XE isn't just its lightest and most aerodynamic car so far, but also the most environmentally sustainable. While more details on the full range will be revealed at the Paris Motor Show next month, the indicative pricing for the XE range will start at £27,000.